The Vikings (Eric the Red) were in fact the first Europeans to discover America, centuries before Columbus. I know that, but in America we have a holiday and parades only for Columbus and not for Leif Erikson a.k.a. Eric the Red. http://stockholm.usembassy.gov/Holidays ... umbus.html . I imagine that has something to do with political expediency. The Italians and Hispanics are a strong voting block. The Scandinavians here have made some attempts to restore Eric the Red to his rightful place, but it always fizzzels, partly because of several questionable historical items like the Kensington Runestone found in Minnesota. There is even some mention of Viking ships (silvery snakes) in the sagas of some Florida and South American Indians. I think that the problem with the vikings is that the discovery was not carried on with long time settlements, so the fact that they came first was forgotten. I agree. My dad, who is Norwegian, always told me that about the Vikings. They were more interested in another land where they settled and were able to stablish one of the greatest nations on earth: Russia. History is sometimes influenced by "National Romanticism" or "Romantic Nationalism". …We stopped in the port of Calicut, in which there were at the time thirteen Chinese vessels, and disembarked. China Sea traveling is done in Chinese ships only, so we shall describe their arrangements. The Chinese vessels are of three kinds; large ships called chunks (junks), middle sized ones called zaws (dhows) and the small ones kakams. The large ships have anything from twelve down to three sails, which are made of bamboo rods plaited into mats. They are never lowered, but turned according to the direction of the wind; at anchor they are left floating in the wind. Three smaller ones, the "half", the "third" and the "quarter", accompany each large vessel. These vessels are built in the towns of Zaytun and Sin-Kalan. The vessel has four decks and contains rooms, cabins, and saloons for merchants; a cabin has chambers and a lavatory, and can be locked by its occupants. This is the manner after which they are made; two (parallel) walls of very thick wooden (planking) are raised and across the space between them are placed very thick planks (the bulkheads) secured longitudinally and transversely by means of large nails, each three ells in length. When these walls have thus been built the lower deck is fitted in and the ship is launched before the upper works are finished." (Ibn Battuta). If you look at models and representations the ships were really wide, unlike the Europeen ships. Columbus' ship Santa Maria was 82 ft long (roughly 20 meters, unlike Zheng He's being more then 100m long. Just look at your scale models of chinese junks as they have the same layout. After the voyages zheng He had the ships were decomminsoned and left to rot in the harbours. Apprently the Chinese forgot how to manufacture the ships (possibly has to do the plans being burnt as Ulrich said) . In general I believe the wide beam is very true. water-tight compartments (also for keeping live fish and for bathing), and triple rudders. Large models in museums, and also sold as a kit by Trumpeter, give dimensions that are bizarre; at 1:1250, the model would come out to approximately 12 cm LOA, 12 cm keel to truck, and a beam of 4.9 cm! Therefore, has anybody seen plans or documents that would disagree with my estimate of this grapefruit-wedge-shaped ship. -western shipwrights could never make watertight compartments in wooden ships, even in the recently clipper era. They have to wait until the advent of iron and steel to subdivide the interior of the ships. Moreover, it was very difficult to make perfectly waterproof the outer skin, so a little water would always enter. -ships (like the Columbus ships) were short because of the limitations of the technology of the era. With the advent of internal iron reinforcement bands, LOA reached more than 50 mts. So it is very difficult to believe that a ship that size could be constucted in those years. Thanks for all the help. I think I will follow roughly this model. 1:1250 will be 12 cm x 5cm. Hight approx. of main mast 7 cm. Yes. Also there are no plans, there is pretty good evidence that these treasure ships were immense. One rudder post was excavated that suggest it would have been OK for a 500 ft ship! 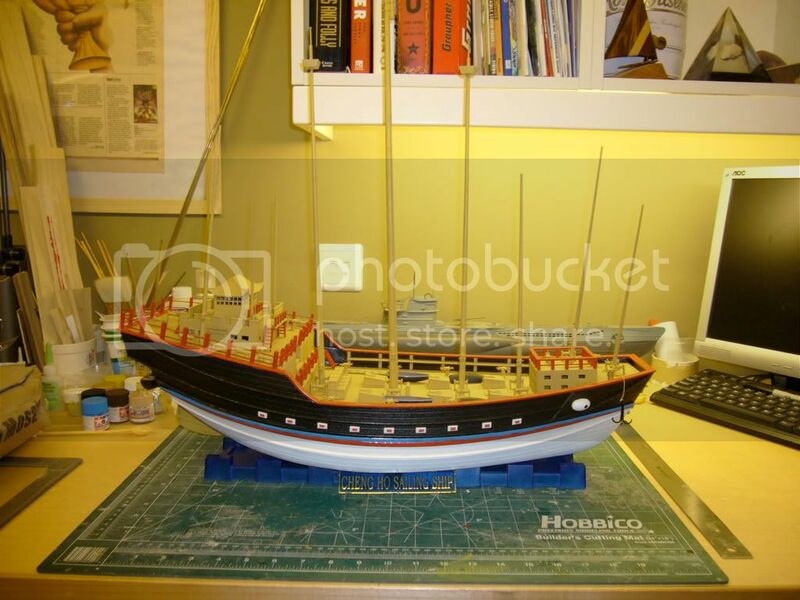 I came upon this thread just the other day as I was researching more on the paint schemes for Zheng He's treasure fleet. I am currently finishing an RC conversion of Trumpeter's Cheng Ho treasure ship which I picked up last month from a hobby shop in Shanghai. Aside from some glaring inconsistencies in regards to scale - their designer must have been drinking too much beijou as he worked up on the kit - its an easy build & makes for an easy conversion to RC due to the huge amount of space in the one-piece molded hull & large rudder. At 60cm long, I didn't go to the trouble of making it a working rig with sail servo but will have enough slack on the sheets it allow it to sail on a broad reach as well as downwind. When the wind doesn't want to cooperate, the 380 motor I installed should push this beamy tub around quite easily. Does anyone know of other conversions made with this kit? Hi guys. Those still believing the crazy theory of the giant ships should read this page http://www.1421exposed.com/.